I've been spending quite a bit of time this year in finally getting down to writing an article about the history of Marvelman, something I've been threatening to do for at least the past six years. I say article, but it's much more likely to be a book at this stage, as I've just reached the point at which L. Miller & Son Ltd. are publishing reprints of Fawcett Comics' Captain Marvel comics, and I'm already nine thousand words in. I have nine chapter headings at the moment, with titles like From Gladiator to Superman, From Superman to Captain Marvel, From Captain Marvel to Marvelman, and so on. At the very end of the piece, I have a chapter called Who Owns Marvelman?, where I'm going to attempt to address the issue of who actually does own the character. 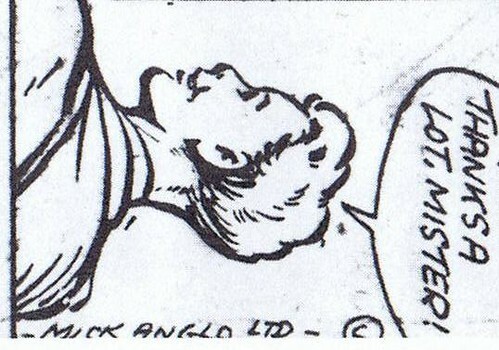 Currently, both Alan Moore and Neil Gaiman, the two most recent writers to work on Marvelman (mostly in his next incarnation as Miracleman), and two of the most honourable and respected men in the field, are of the opinion that Mick Anglo, who created the character for L. Miller & Son Ltd., held copyright all along. It's not that I wished to disagree with them, but I had always wanted to find some sort of proof that this might have been the case. I've seen a few mentions in articles about Marvelman that state that Anglo had inserted copyright notices into some of the Marvelman comics pages he produced for Miller, but in the absence of any actual proof of this, I was inclined to be cautious. In the course of the six years that I've been researching this article, I've accumulated a lot of bits and pieces in various books and magazines about Marvelman, and not all of them are wholly accurate, and I've tried to take a conservative approach to what I'm writing, so if I can't find a reliable source for a piece of information, I'm not inclined to included it, and I cite my sources as much as possible, except for information that seems to be well known, and that isn't in dispute. So, if I couldn't find some sort of proof for myself, I was just going to have to ignore it. There is one claim that's worth mentioning, before I move on: in the second edition of Matthew H Gore's The Origin of Marvelman (Comics Monographs Vol. 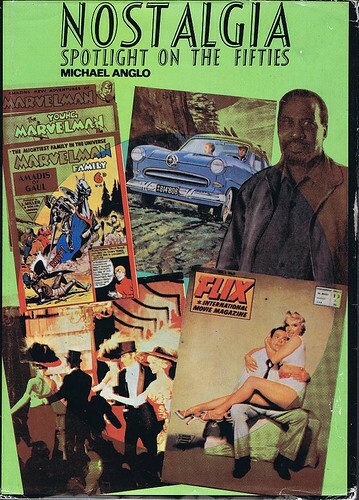 1 No 1, Boardman Books, 2006 & 2008), there is a reproduction of a copyright notice that reads, Mick Anglo Ltd. © 1958, which is explained thus: "Anglo's claim to Marvelman is based on copyright statements like the one reproduced above. Reportedly taken from Marvelman and the Ghost of Old Backwoodsville in Marvelman #297 ..." I have a few problems with this. Firstly, the fact that the author says, "Reportedly taken from..." means that he seems to have only seen a photocopy of the copyright notice, rather that the full story that the notice comes from. Secondly, this notice comes from quite late in Anglo's involvement with the character. 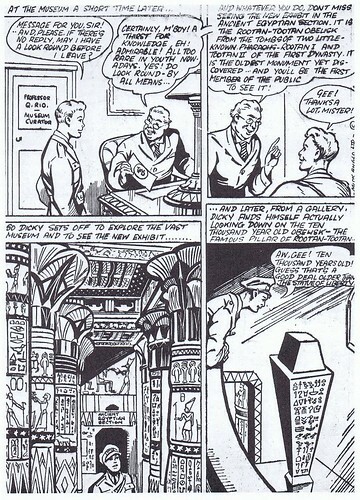 The creation of Marvelman took place in late 1953, with his first appearance being in February 1954, in the confusingly numbered Marvelman #25. Although Miller was publishing Marvelman comics until 1963, Anglo ceased produding them in 1959 or 1960. So, a copyright notice from 1958 might only prove that Anglo belatedly decided to lay claim to the character, before finally leaving it altogether soon afterwards. Although of course to mitigate against that is the fact that Miller did actually publish the comic with Anglo's copyright notice in it. In any case, the whole thing is unclear, and not really the kind of unambiguous proof I was looking for. So, finally, it seems I have all the proof I need. 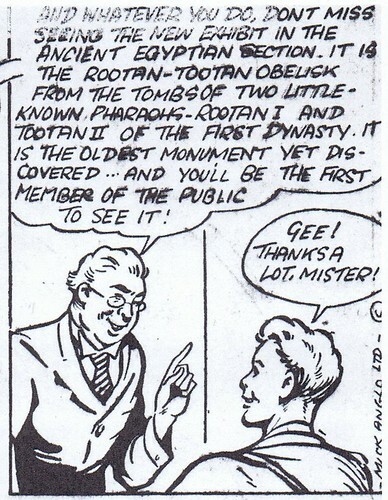 Young Marvelman the character was created at the same time as Marvelman, and Young Marvelman the comic shared the same numbering as Marvelman, so started its weekly schedule at #25. 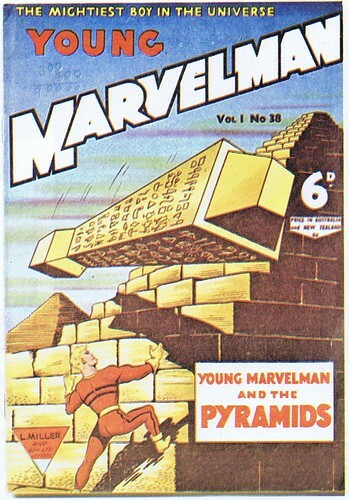 It follows that Young Marvelman #38, from which the above is taken, was published thirteen weeks in the title's run, putting it somewhere in May 1954, and from this there would seem to be no other conclusion to be drawn except that right from the very beginning, Mick Anglo was claiming that he owned the copyright on Marvelman and associated characters. Of course, it is just possible that the copyright notice was added at a later date, like when Anglo was preparing Nostalgia - Spotlight on the Fifties for publication, but I think this is unlikely, as he would have been more careful of its positioning, rather than having it being slightly cut off, as it is on the page that's in the book. You've been a real Trufflehound in regard to this and I love the dedication you've shown. Nice work. And I really like that hand-crafted Marvelman page. Thanks. I just wanted to nail everything down, as I've just seen enough unverified reports to last me a lifetime. Surely some sort of proof is not too much to ask for? I'm not sure how you can call that a "smoking gun" seeing as you're still looking at a reproduction and not the original comic. Maybe he "would have been more careful" with the positioning, maybe he "wouldn't". I think someone must have copies of those early issues, and can be talked into having a read through for copyright symbols, no? Seems the simplest way to verify the evidence. Marvelman and the THUNDER Agents have two of the most convoluted copyright histories in comics. Marvelman more so, I'd say, but it's close. And the story is not yet over - there's still the boondoggle of who owns the Warrior/Exclipse stories. No matter who owns the rights to the character (and I do agree; if it's anyone it's Anglo) there's the point of the stories themselves, and the art for same. So far, it seems to me that Marvel does NOT have them. They have a sandwich with nothing inside. And it's that stuff in the middle that everyone wants. Having done a lot of work on Miracleman / Marvelman myself, I applaud your work here. I would just point out that "Mick Anglo was claiming that he owned the copyright on Marvelman and associated characters" does not equal that (1) he owned it at the time, (2) he owned it during the Quality years, or (2) he still has a claim. The case for Mick Anglo's ownership has certainly been boosted in recent years, particularly as no one seems able to prove that Dez Skinn acquired ownership from the British copyright receiving office, as per his accounts. I agree with your conclusions and only want to stress that we shouldn't read beyond them. The smoking gun is that Anglo made the claim, but there's much more to be established. Should've asked me, I've had a copy of this book on my shelves for about 6 years now! ;-) I have to agree with Julian Darius about Mick's CLAIM that he had the rights. Doesn't always equate the same thing as to actually HAVING the rights to something. Many artists and publishers whack on a copyright sign thinking that it makes their claim de facto but it ain't necessarily so! I doubt this will ever be resolved. The only way it's likely to be resolved is that Marvel will claim it's theirs to publish everything and take anyone who argues to court forever. They could tie this up ad infinitum and they have the lawyers and money to do it. I think all the creators seem to have washed their hands of it and would be happy with a reprint royalty whoever published it! Presumably, as a start, we'd have to look up 1950s British copyright law, and see what is says about registration and notice. An experienced British intellectual property attorney could probably rattle an answer off in a minute. excellent detective work here. I've written any number of times about Miracleman on my blog as well (enough to piss off Dez Skinn into replying to one of my last posts: http://inkdestroyedmybrush.blogspot.com/2009/05/miracleman-redux-penultimate-chapter.html), but i concur with the two posters above: one, someone who knows british copyright law needs to weigh in and 2, some with those original issues needs to spend an evening with them rereading and looking for legal notices. Being in the states, is there a likelihood of there being a relatively complete collection anywhere of the 1950's books? I've enjoyed your blog, and the posts on history of Marvelman herein from other pages herein. Also, here is a note and comment I cared to share. It also means that, finally, Gaiman and Buckingham might well take the opportunity to finally finish their storyline, over two decades after they started. Also, here is a note and comment. It also means that, finally, Gaiman and Buckingham might well take the opportunity to finally finish their storyline, over two decades after they started." Yes, I know Daniel from the Oh Danny Boy blog. Let us just say, I don't entirely share his confidence that this is over.